Voice Campaign: This is a simple voice broadcasting campaign also known as message campaign that dials numbers from a contact list, on answer by the recipient, plays recorded voice message and then hangs up. 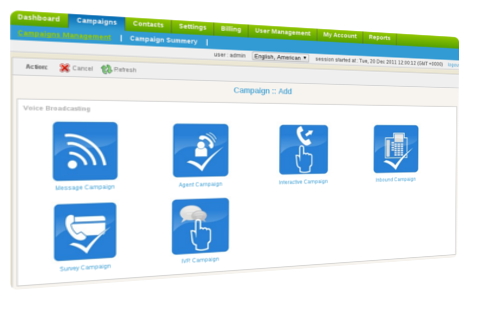 Agent Campaign: Agent campaign dials numbers from contact list and on answer by the recipient, directly forward call to agent/external call center/IVR system. ICTBroadcast offers integrated web phone for agents. This WebRTC based phone allow agents to receive calls only using their browsers, without any additional hardware or software. Interactive Campaign: Interactive campaign allows call recipient to respond by pressing some DTMF keys on its phone. This campaign starts by dialing numbers from a contact list, on answer by the recipient, plays recorded message and if recipient presses some desired key, it forwards recipient to a live agent for further call handling. Inbound Campaign: Inbound campaign works like IVR system. User publishes incoming numbers (DIDs) and interested callers call this/these number and listen a prerecorded voice message. If caller presses desired key, the call will be forwarded to live agents for further call handling. Survey Campaign: Survey campaign dials number from contact list, on answer by the recipient, asks a set of questions and records their responses from recipient and prepares report for further analysis.  IVR Campaign: IVR campaign broadcasts IVR (Interactive Voice Response) message. IVR is a technology that allows a computer to interact with humans through the use of voice and keypad inputs.This campaign dials number from contact list, on answer by the recipient, plays IVR message and on the basis of responses from recipient, it performs some operations, for example, call transfer, get digits, say date time, plays some other message etc. Fax Campaign: Faxing has a re-birth since the advent of FoIP communication and internet telephony. Fax campaign in ICTBroadcast dials numbers from contact lists and on answer by the recipient, transfers fax documents. Built-in support for pdf and tiff document but can be easily upgraded to support any document format. SMS Campaign: This campaign, just like any other campaign, simply broadcasts a text message to all the numbers from a contact list. Email Campaign: Email campaign sends email to the specified email address of each of your contact.